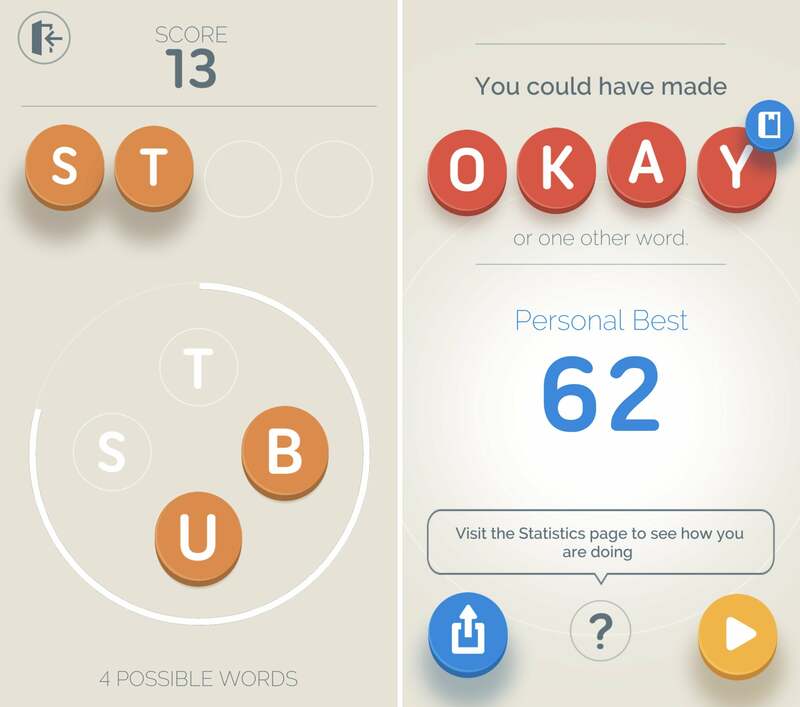 Flex your lexicon with these wonderfully wordy iOS games. 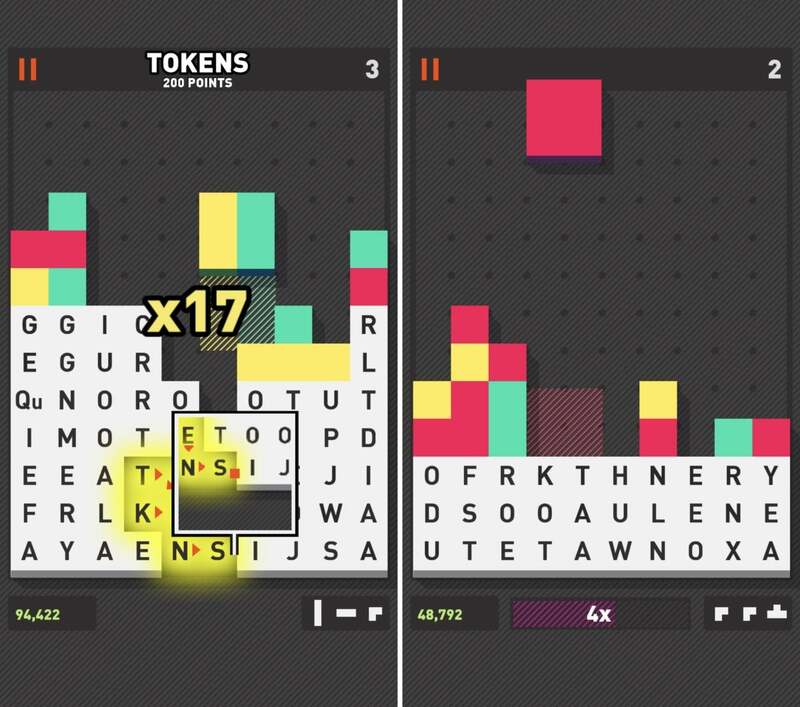 We recently highlighted our favorite puzzle games for iPhone and iPad, but we purposely left out word games from that list. Why? Well, it helped us finely focus our selections, certainly—but more importantly, word games have such a unique appeal that it felt like they warranted their own dedicated list. And when it comes to brainy word games, there’s more than just puzzlers: while there are plenty of word-building games on this list, we also have games in which words are wielded as weapons, or to create useful objects. 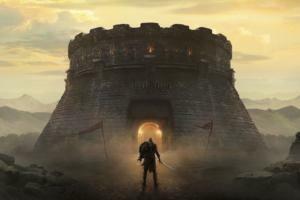 Some of these games share common elements, while others are totally distinct—but they’re all united by their wondrous wordiness. So grab a few of these, polish up your vocabulary, and enjoy. Letterpress isn’t a particularly new iOS word game, but five years after its debut, it’s still one of the absolute best. 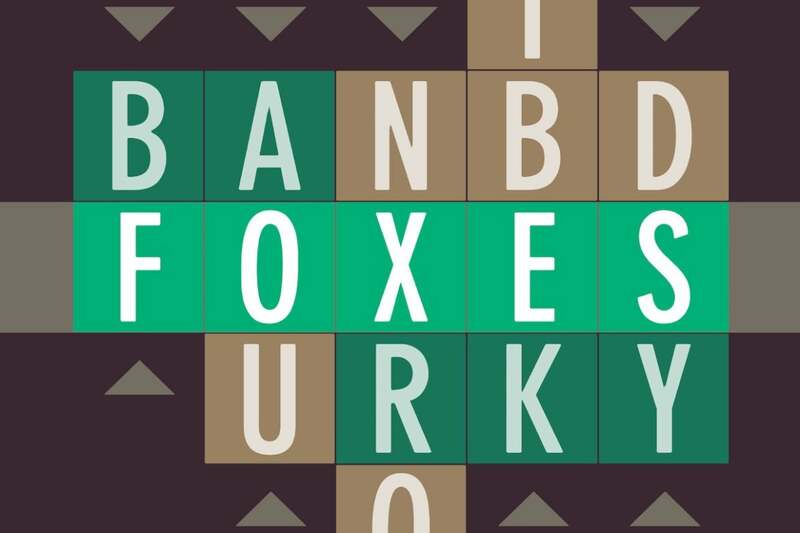 This turn-based, competitive game blends Boggle-like word creation with tactical maneuvering, putting as much emphasis on where you use letters on the board as which words you ultimately end up spelling. 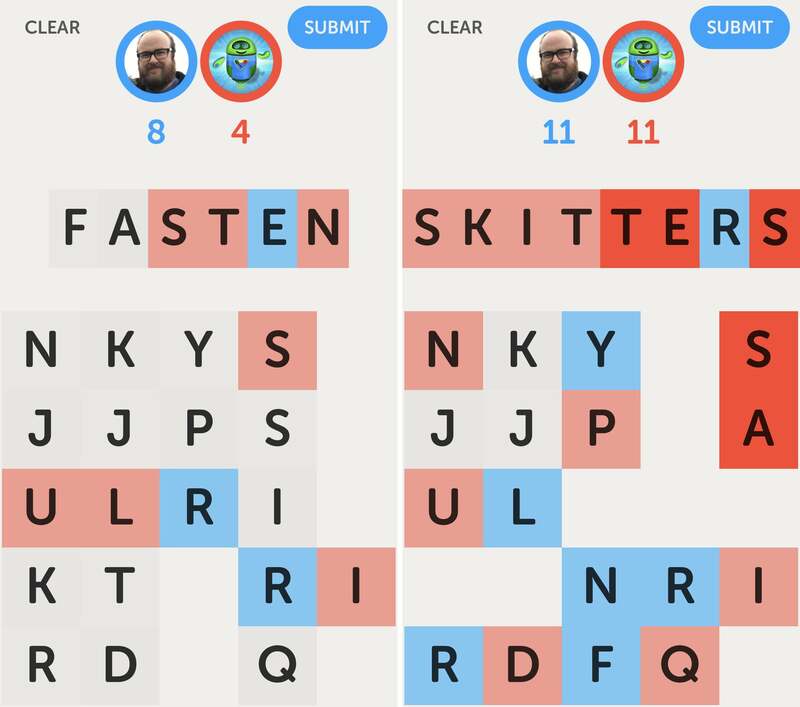 As you craft words from the 25 jumbled letters onscreen, you’ll claim those spaces for your color—and the winner is the one who finishes the match holding the most tiles. However, it’s not just a constant back and forth, as you can secure tiles (keep them from being stolen) by surrounding them with other claimed letters. It’s ultra-minimal but incredibly smart, not to mention wonderfully compelling stuff. 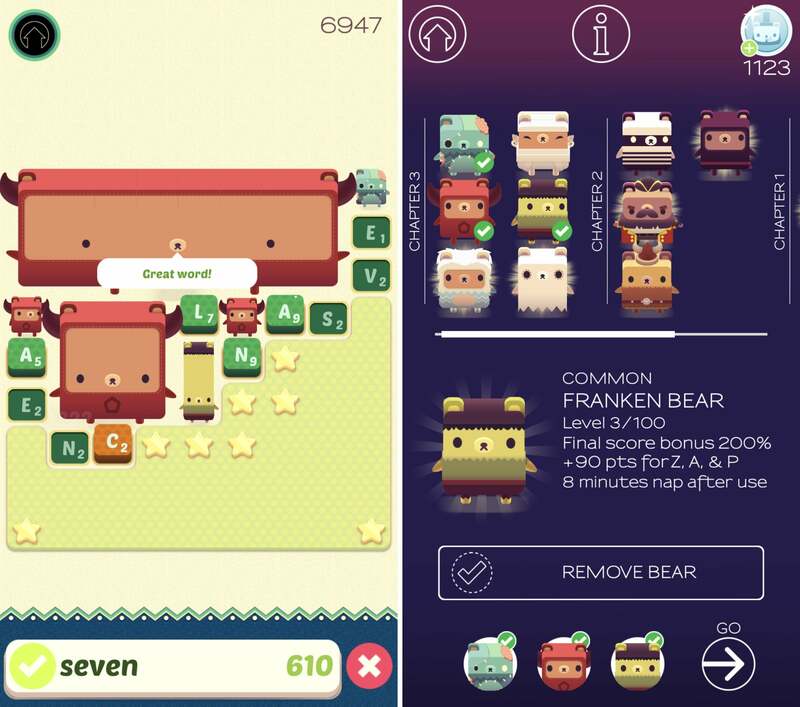 As fans of both clever word games and adorable bears of all shapes and styles, we can’t help but love Alphabear. Luckily, it brings both together in a highly compelling manner, and despite the familiar presence of Scrabble-esque tiles, it doesn’t really play like anything else out there. You’re tasked with building the best word you can from the tiles on the screen, and when you do, those tiles are converted to bears that combine and expand to fill the space. But if you don’t use certain letter tiles before they expire, they turn to stone, thus blocking bears from growing as large and as valuable as they should. It’s a fun blend of wordplay and strategy, along with collectible bears that provide very specific bonuses that can be mixed and matched. Scribblenauts Remix is a creative delight, and one that truly shakes up the entire concept of “wordplay.” In this inventive puzzle game, you’re provided with odd conundrums with open-ended solutions. 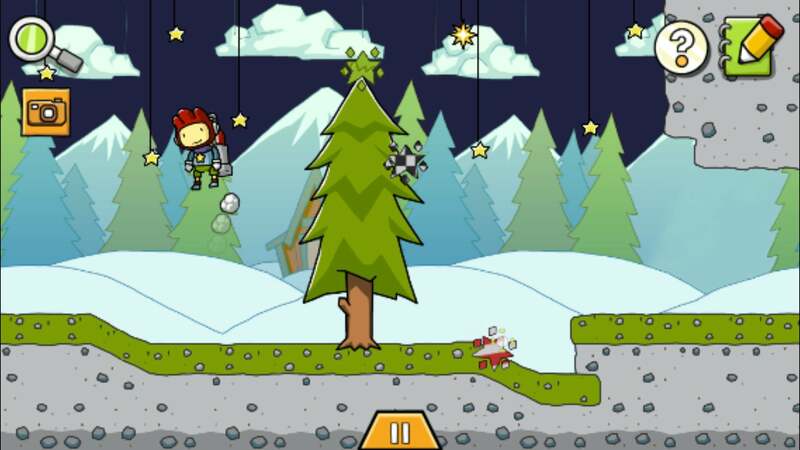 For example, there’s a star you need to collect on top of a tree, and you’re just a boy. How do you get it down? Well, you’re a boy who can will things into existence using your words. So if you type in “jetpack,” you’ll be given a jetpack that’ll let you fly up and grab the thing. Type in “hatchet” and you can just cut down the tree. That’s one of the simpler challenges, but they become quite a bit more complex, and you’ll need to use your word power and problem-solving abilities to think up crafty solutions along the way. 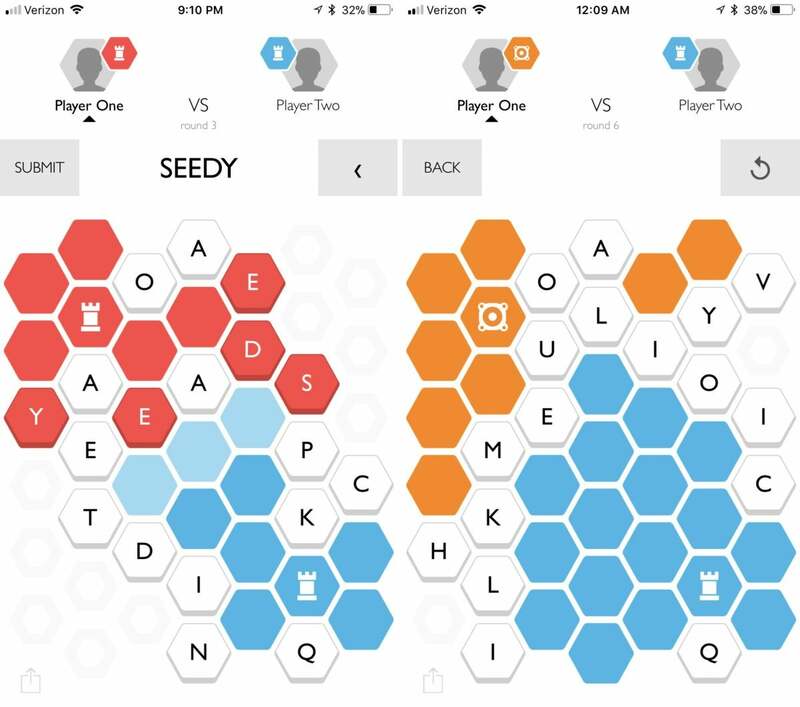 Another one of the enduring iOS word game greats, SpellTower has been a fan favorite for more than five years now, and it has gradually been improved and enhanced over time. With a large stack of letter tiles, you’ll need to link together terms to clear them from view, set up other word combos, and notch huge point tallies. And SpellTower offers a few different ways to experience this core premise. 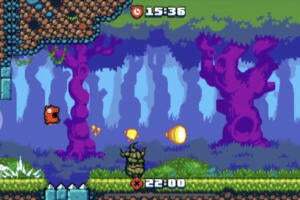 For example, in the Tower mode, you’ll have 140 tiles to work with and you can play at your own pace to try and set a high score. But in the endless Rush mode, new lines are added gradually, forcing you to keep clearing words at a steady pace or risk running out of space. It’s a game we keep coming back to, time and again. You might shout out a few of the spicier four-letter words while playing Four Letters, a rapid-fire and incredibly fun spelling game that challenges you to keep building tiny words. Just four letters appear onscreen, and you’ll need to quickly tap out a real word to get the next set—and so on and so forth for as long as you can keep time on the clock. Four letters don’t sound like a lot, right? Sure enough, the game starts off pretty easily with really obvious solutions, but then it tosses in some letter sets that might really throw you for a loop. And you’ll have to play fast to even survive, but if you can play extra fast and solve words within a second or so, you’ll get bonus points and build up streaks. It’s addictive! Blackbar is not like the other games in this list, because you’re not building words; instead, you’re writing them to fill in mysterious blanks within typed letters. No, this isn’t Mad Libs—you have to try and figure out the exact word that’s missing to move on to the next word puzzle, and you’ll do so via context clues and a fair bit of racking your brain. Why are there words missing? 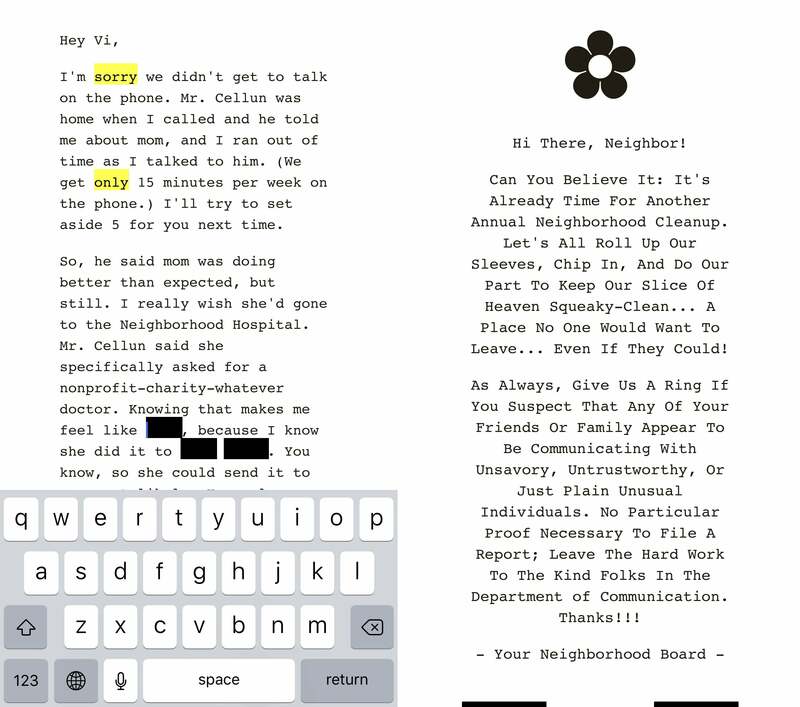 They’ve been censored, and gradually, you’ll start to figure out why certain words have been redacted and what exactly is going on in the storyline. Blackbar has its frustrating moments in which you’re staring at a black box, unclear on exactly which word perfectly fits the opening, but the message here is compelling and worth struggling for. 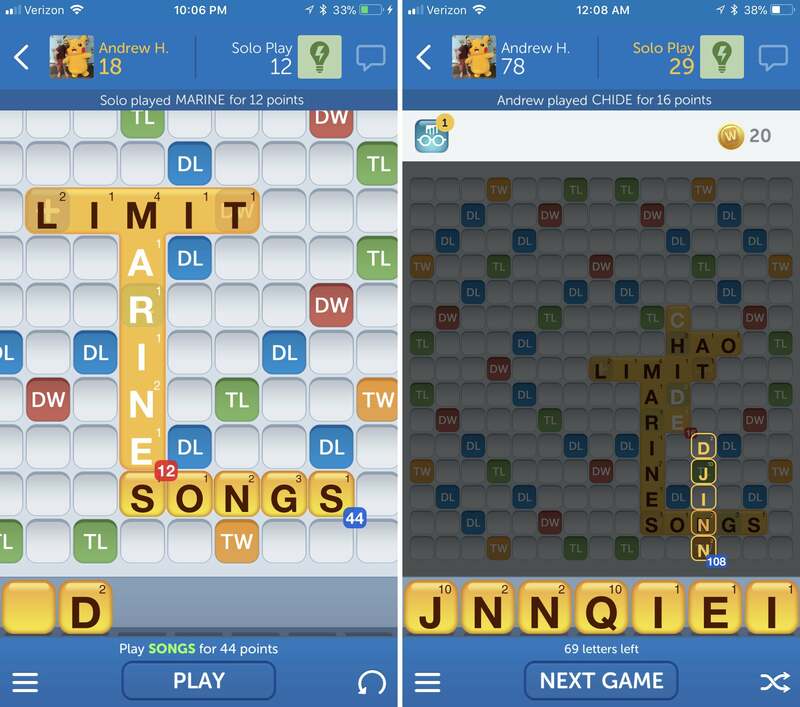 Zynga’s Words With Friends is no longer the world-conquering phenomenon it once was, back when it was the iPhone game that seemingly everyone you knew was playing it. But while many of us had our fun with Words and moved on from it, the game itself is still a blast. It’s just Scrabble—unofficially, of course—but shifting the word-building board game into an asynchronous, turn-based mobile experience lets you play on your own time, wherever you are, without feeling locked into a timely commitment. 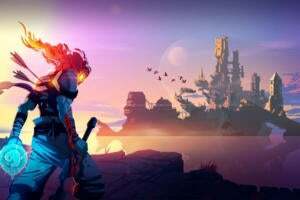 The ability to play numerous games at once provides as much brainy entertainment as you need, and chances are good that at least a few of your Facebook friends are still playing. Why not join them? 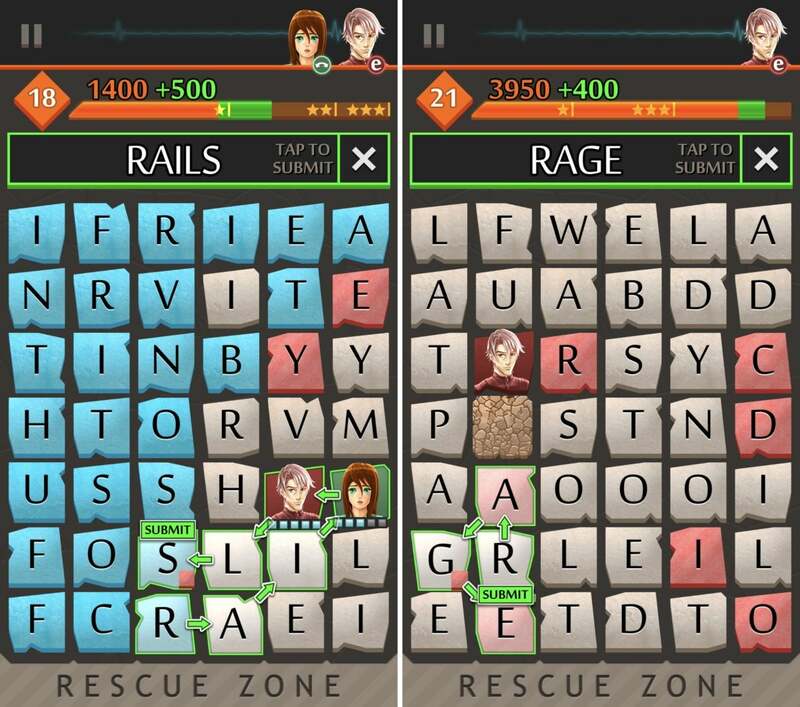 As word games go, Highrise Heroes is… well, pretty strange. It’s a game about linking together nearby letters, which isn’t so odd or atypical in the genre, but it’s also a game about saving a group of people on the top floor of a skyscraper following an earthquake. And each new level you face guides this makeshift crew closer to safety. That’s not only window dressing, but also a key part of the experience: you’ll need to make words to clear paths on the board to guide characters to safety, or link together letters with oxygen tiles to keep them breathing. The story itself is goofy, but the way Highrise Heroes uses the premise to shake up the usual word-building gameplay is actually pretty ingenious. He did it first with SpellTower, and now Zach Gage has done it again with TypeShift, concocting a word-creation game that you just don’t want to put down. 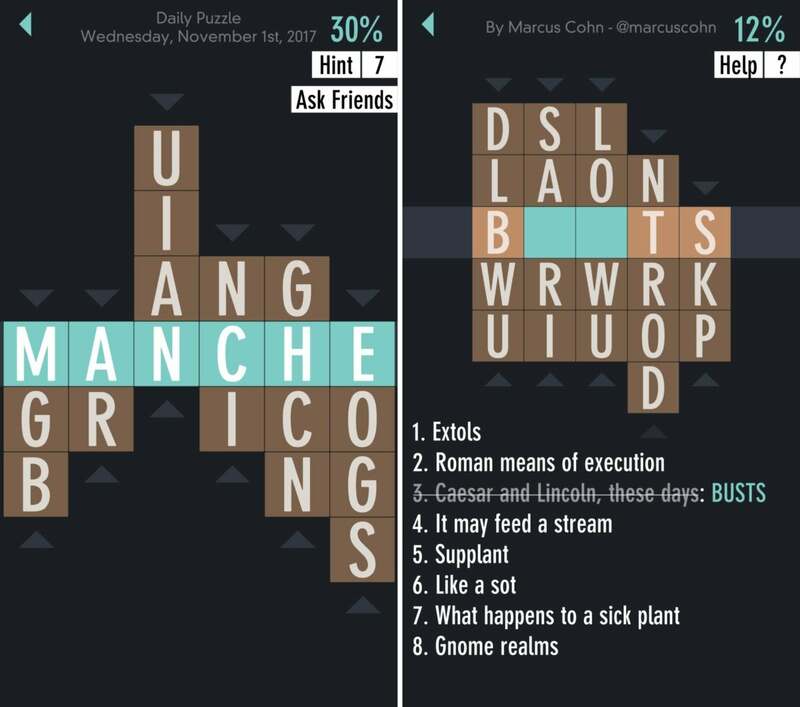 TypeShift is described as “anagrams meets word search, with a sprinkle of crosswords,” and that should give you the gist of why this is such a uniquely compelling combination. Across hundreds of included puzzles, you’ll need to shift columns up and down to create real words, whether you’re trying to ensure that every tile on the board gets used, or if you’re aiming to create words to match clues listed below. Like SpellTower, TypeShift not only creates a compelling core experience, but it also has enough variations to keep you hooked for a long time. Oh… Sir! 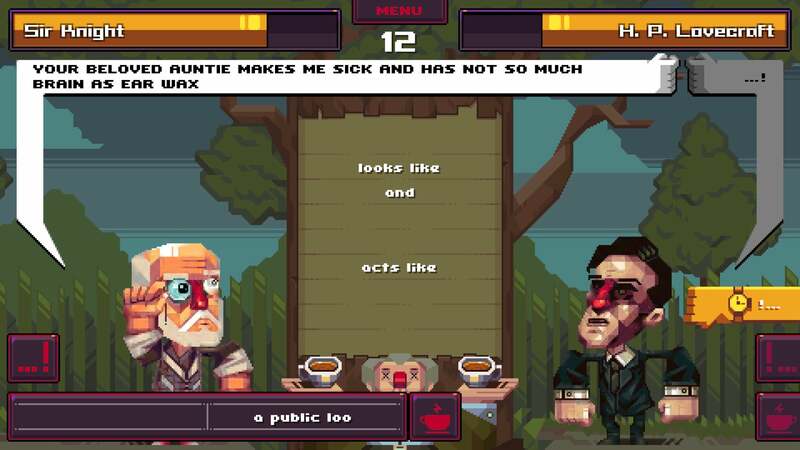 is probably not the kind of word game you expected to find on this puzzle-packed list, but this inventive insult simulator is hilarious and incredibly entertaining. And yes, while you don’t have to think up terms from a jumble of letters, it still requires you to wield words, which are weaponized to shame and demoralize your opponent. For giggles, of course. 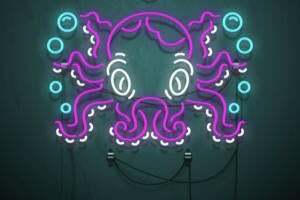 You and an opponent—online, local, or computer-controlled—will take turns picking words and phrases from a shared pool, all in the hopes of building the baddest burn of them all. It’s goofy and only lightly naughty, with a sharp dose of British humor throughout and amusing characters to choose from. Sequel Oh… Sir! The Hollywood Roast is also available on iOS. Unlike a lot of low-key word games, Puzzlejuice promises to “punch your brain in the face”—and that’s an invitation you might want to consider. Besides the attitude and punchy color scheme, what really sets Puzzlejuice apart is the way it blends word games and puzzlers: it’s part Tetris, part color-matcher, and part Boggle, all wrapped up in one experience. Tetris-like pieces fall in from the top, and when you create a complete line (or link up and tap like-colored bunches), they turn into letters. At that point, you’ll need to connect the nearby letters to create words. It’s a lot going on at once, but that’s what makes it so entertaining. It’s also from the maker of the brilliant Threes!, in case you need more goading. 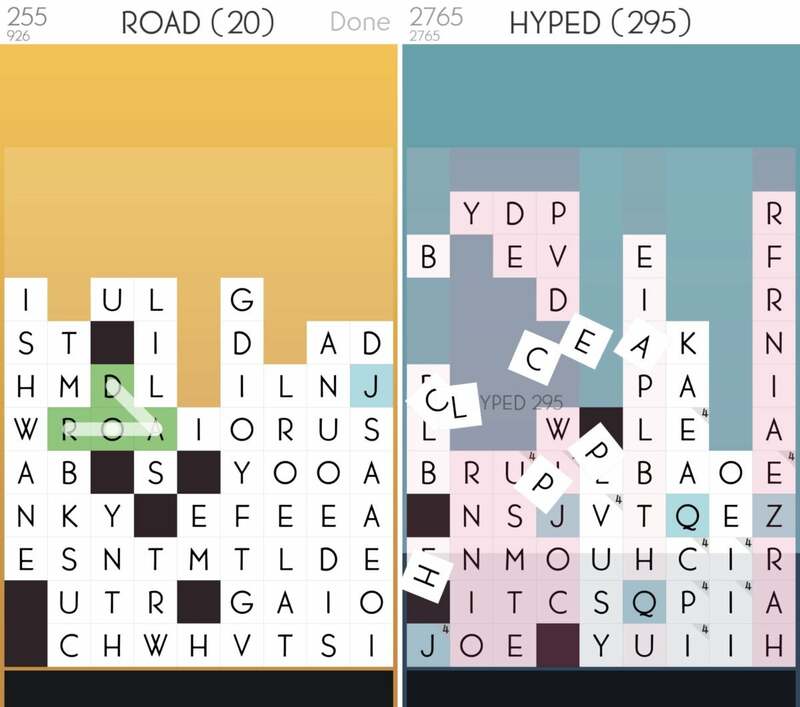 NimbleBit’s Capitals shares a lot of similarities with the aforementioned Letterpress, admittedly, from its blend of word creation and territorial control to its default colors for each side. 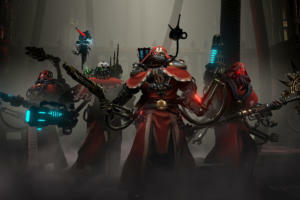 Thankfully, Capitals brings enough tactical differences to make this brainy word-battler also well worth digging into. Here, you’ll begin with your own capitol on a hex-grid board with letter tiles, and constructing words claims new spaces for your cause. Of course, your enemy will do much the same, and the goal is to ultimately wipe out your opponent’s territory and take over the board. Winning in Capitals is less about building the best or biggest words, and more about where you put them and when. Spell strategically, friends.